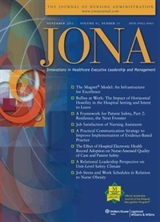 JONA is the authoritative source of information on developments and advances in patient care leadership. Content is geared to nurse executives, directors of nursing, and nurse managers in hospital, community health, and ambulatory care environments. The Library has access to issues from 1996 to the current issue. 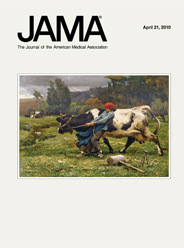 JAMA is an international peer-reviewed general medical journal. The key objective of the publication is to promote the science and art of medicine and the betterment of the public health. The Library has access to issues from 1998 to the current issue. American Journal of Nursing's mission is to promote excellence in professional nursing, with a global perspective, by providing cutting edge, evidence-based information that embraces a holistic perspective on health and nursing. The Library has access to issues from 1900 to the current issues. 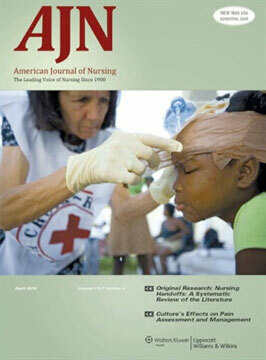 Go to AJN via JSTOR US for issues 1900-2003. Go to AJN via Journals @ OVID for issues 1996-current. National Library of Medicine PubMed is a database of over 15 million citations for articles published in more than 4800 biomedical journals and magazines from the U.S. and 70 other countries. Coverage dates back to the 1950's. Links to full text and related resources are included. This site gives full-text access to 223 peer-reviewed open access journals in the fields of medicine and biology. All articles published by BioMed Central are archived and available in PubMed Central. Academic Writer is APA's authoritative solution offering you a complete digital environment for teaching, learning, writing academic papers, and full integration of APA's best-selling Publication Manual of the American Psychological Association®. APA Note: Remote access is restricted to UHV users.